Celebrating the 50th anniversary of Doctor Who, this Sourcebook explores the Ninth Doctor's adventures on Earth and beyond. 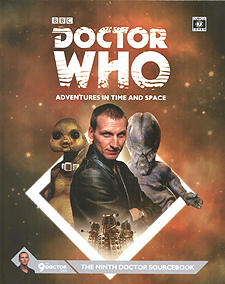 With detailed information on all the allies, enemies, aliens and gadgets that he encounters, as well as examining each of his adventures, the book contains a wealth of material for the Doctor Who: Adventures in Time and Space RPG, and is also a fact-packed resource for fans of the show! The Last of his Kind, the Doctor returned to Earth, haunted by what he had done to end the Last Great Time War. Witness the Earth's destruction as the Sun expands, unmask aliens in the British government, dance with Rose Tyler during the Blitz and team up with Captain Jack to save the world. Discover the fate of the Daleks, prevent World War Three and uncover the secret of Bad Wolf!